Change from greed and corruption to equality and protection of Cambodia. 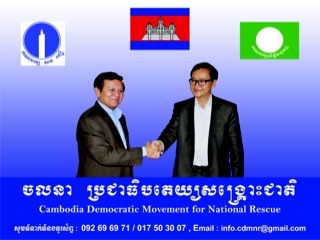 Cambodia’s two largest opposition parties – the Sam Rainsy Party and the Human Rights Party – yesterday announced plans to merge into a single entity: the Cambodia Democratic Movement of National Rescue. We will never forget. We want to know : Who Killed Chea Vichea? For those who have not seen this documentary video, please take your time to watch about one of our HEROES. Over 67.000 viewers. Let’s make it a million. Sam Rainsy and Kem Sokha, will travel to the US next month to lobby for Sam Rainsy’s return to Cambodia before national elections next year. WASHINGTON – The leaders of Cambodia’s two opposition parties, Sam Rainsy and Kem Sokha, will travel to the US next month to lobby for Sam Rainsy’s return to Cambodia before national elections next year. Sam Rainsy has been in exile for more than two years, having been found guilty on a number of criminal charges he says are politically motivated. The two men, who hope to meet with US State Department officials and other groups in the US, are making their trip in the midst of the high-profile arrest of Mam Sonando, the owner of one the few remaining independent radio stations in the country, Beehive. Mam Sonando is accused of leading a secessionist movement in Kratie province, a charge critics say is likely a fabrication. All of this adds to mounting concerns that the space for free speech and association are shrinking, as the ruling Cambodian People’s Party makes continued political gains at the national and local level. ​​Lao Monghay, an independent political analyst in Phnom Penh, told “Hello VOA” on Thursday that recent events should cause concern about the development of the country as a democracy. These events and others have created a freeze on political expression and the engagement of people in their society. ​​“When people do not care about society, society is going to dissolve,” he said. Crackdowns on parties and groups that are not aligned with the government have created a culture where people “don’t do politics, don’t speak out about that which affects politics,” he said. Sam Rainsy, who has led to opposition for many years, has been living in exile since 2009, after he destroyed markers on the Vietnamese border in Svay Rieng province. He was found guilty of incitement and destruction of property over the incident, and with more crimes after he posted a border map on his website the government said was false. He now faces more than 10 years of jail time if he returns, and the guilty charges against him make him ineligible to run in parliamentary elections slated for July 2013. Members of his Sam Rainsy Party have since seen their immunity stripped and have been jailed. Opposition-friendly journalists have also been jailed, especially under a law that makes defamation a criminal offense. His party and the Human Rights Party have agreed to join in a unified opposition, under a general Democrat Movement, following gains made by the ruling CPP in local elections in June. Full details of the merger have not been released, and election monitors say if they begin a new party they will have to give up the seats in parliament each party currently enjoys—26 for the Sam Rainsy Party and three for the Human Rights Party. Nevertheless, both men will come to Washington in hopes of finding a way to put pressure on Prime Minister Hun Sen and the government to find a way for Sam Rainsy’s return. Both men will attend a forum for Khmer minorities living in Vietnam, known as the Khmer Kampuchea Krom, in Montreal, next week. 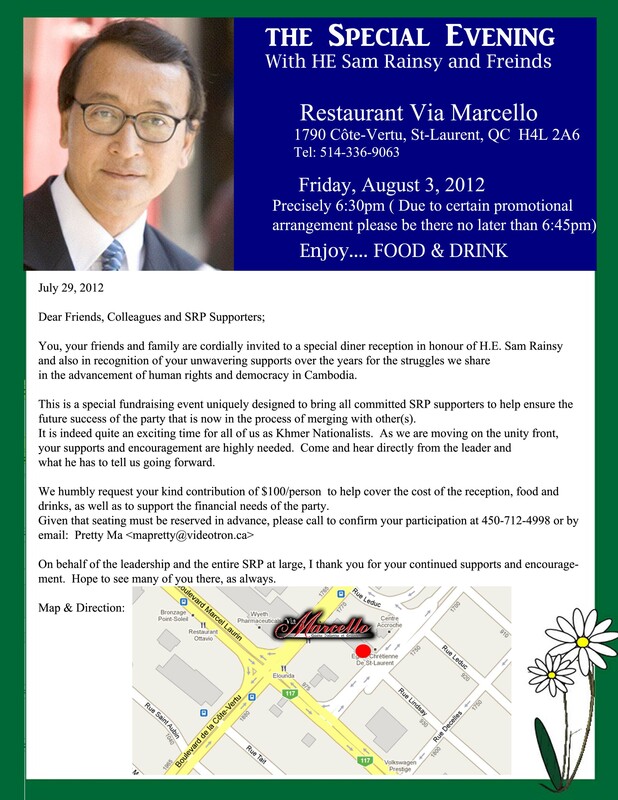 It remains to be seen whether they can successfully lobby for Sam Rainsy’s return. Prime Minister Hun Sen has said there will be no political solution and that his case is a matter for the judiciary. Koul Panha, director of the Committee for Free and Fair Elections, said Sam Rainsy’s position on the border should be a matter for voters, not the courts. With Sam Rainsy out of the country, his party is at a disadvantage in elections, where people look at leadership and policy before they vote, he said. Without that leadership to encourage party supporters, the election will be difficult, he said. Lao Monghay said victories by politicians in exile are not unheard of, however, including in Cambodia’s own history. Meanwhile, a crackdown on Mam Sonando and his Association of Democrats continues. Mam Sonando remains in jail on charges related to sedition, and now more members of his association have come under pressure for their association with him. Members have been putting together a petition to have him released from custody at Prey Sar prison, outside Phnom Penh. On Friday, authorities briefly detained 75-year-old Chhey Lay, a member who was helping gather thumb-prints for the petition. He was held for three hours until he agreed not to continue collecting prints, which authorities compared to “incitement,” he said later. Villages set on fire to clear land for sugar company in Koh Kong. SIGN PETITION AND SPREAD AS WIDELY AS POSSIBLE. THAI HUMAN RIGHTS COMMISSION RECOGNIZES HUMAN RIGHTS VIOLATIONS BY SUGAR COMPANY- A MAJOR STEP FOR JUSTICE FOR KOH KONG FARMERS. E.B.A. MUST BE SUSPENDED FOR SUGAR MADE IN CAMBODIA. THE CAMPAIGN IS WORKING BUT IT NEEDS FURTHER PUSH FROM YOU. JOIN NOW! On Eve Of Key Trial In Cambodian Court, Thailand’s National Human Rights Commission Finds Evidence Of Human Rights Violations While Industry Sugar Association Hears Complaint Against U.K.’s Tate & Lyle Sugars Against Backdrop of Global Sugar Boycott. Phnom Penh, Cambodia — More than five years after three villages and hundreds of farmers in Koh Kong Province, Cambodia had their lands illegally confiscated to make way for a major international sugar plantation connected to leading Thai, U.K, U.S., and Taiwanese corporations, the Koh Kong Provincial Court of First Instance will finally hear arguments on July 26, 2012. The long-running dispute pits residents of Chikor Leu commune’s villages of Trapeang Kandol, Chhouk and Chikor of Koh Kong’s Srae Ambel District against the companies, Koh Kong Sugar Industry Co., Ltd. (KKS) and Koh Kong Sugar Plantation Co., Ltd. (KKP) over an Economic Land Concession (ELC), that resulted in wide-spread displacement, severe livelihood impacts, and violent human rights violations; two-hundred and twenty villages from the affected communities are plaintiffs in the case, all of whom are appearing before the court on the hearing date. Civil society organizations in Cambodia released a statement on the legal case this week affirming their support for the impacted communities. The two implicated companies, KKP and KKS are 70% owned by leading Thai corporation Khon Kaen Sugar Industry Public Company Limited (KSL) which exercises effective control over operations in Cambodia and receives 100% of the processed sugar from the two Cambodian land concessions. Taiwanese Ve Wong Corporation holds 30% of both subsidiary companies, while powerful Cambodian Senator Ly Yong Phat formerly held shares in both subsidiary companies before allegedly relinquishing these stake-holdings in 2010. The sugar produced in Cambodia is then sold to U.K.’s Tate & Lyle Sugars, a subsidiary of Tate & Lyle that was recently acquired by U.S. American Sugar Refinery Company. The dispute in Srae Ambel District began when the two Thai companies, KKS and KKP were granted ELC’s of 19,100 hectares in Srae Ambel District by the Government of Cambodia in violation of the Land Law 2001, sub-decree on Economic Land Concession 2005, and an agreement made between the companies and the Ministry of Agriculture, Forestry and Fisheries. Under Cambodia law, ELC’s cannot be granted in excess of 10,000 hectares, and in a blatant attempt to circumvent this requirement, KKS and KKP were incorporated separately despite serving a single business interest and essentially operating as one, and were each granted concessions just under 10,000 hectares. No consultations with the farming communities were conducted and no compensation in advance was made. In Cambodia today, hundreds of thousands of people are being displaced from their homes, farmlands, forests and fisheries as investors plunder the country for private profit in the name of ‘development’. In rural areas, more than 2 million hectares have been granted to private companies as concessions for the development of agro-industrial plantations. The sugarcane industry has been one of the worst offenders driving this land-grabbing crisis. At least 75,000 hectares in economic land concessions have been granted to private companies for industrial sugarcane production in recent years. These concessions have led to the destruction of protected forests, the pollution of water sources, and the forced displacement and dispossession of thousands of people in Koh Kong, Kampong Speu, Oddar Meanchey and Svay Rieng provinces. Crops have been razed. Animals have been shot. Homes have been burned to the ground. Thousands of people have been left destitute. Some have been thrown in jail for daring to protest. Despite the abundant evidence of these crimes, none of the responsible individuals and companies have been held to account. Meanwhile, the sugar that is tainted by gross human rights abuses is exported to Europe, where suppliers and importers receive special trade benefits under the Everything But Arms initiative. For the past two years, we have called upon the companies that are producing and selling this sugar to provide restitution to those who have lost their land, homes and livelihoods to make way for their plantations. We have sent letters and filed complaints against Ly Yong Phat, Mitr Pohl, KSL, Ve Wong Group, Tate and Lyle Sugars and its parent company American Sugar Refining (owner of the Domino Sugar brand in the United States). These companies have all failed to respond and take action to repair the harm that their business has caused to so many Cambodian families. So, today we are calling upon consumers around the world to stop buying their products. In particular, we urge consumers to boycott Tate and Lyle and Domino Sugar. To kick off this campaign, leaders of affected communities and Clean Sugar Campaigners launched a powerful online video at a press conference today in Phnom Penh. Click here to watch the video or search for Taste and Smile? on YouTube. Watch it. Share it. Take action. Sign the petition and let Tate and Lyle Sugars and Domino know you will stop buying their products until they pay back the Cambodian farmers who lost everything so that they can make a profit. Ten Cambodian and European civil society organizations and coalitions published an open letter to European Union Trade Commissioner Karel de Gucht on June 26 calling upon the EU to investigate serious human rights abuses connected to agricultural goods, including sugar, being exported to the EU under the Everything But Arms initiative.